Second day of chemo this morning (well yesterday morning now as it is 2am the next morning) and I just can’t get some things out of my head! In the treatment room today there was a mother being kept company by her two adult daughters (guessing in their late teens, early 20s). I never went to chemo treatment with mum. Why didn’t i do that? Was I in denial? (likely); was she shielding me from it and not making me feel like I needed to be there? (absolutely); is it something I regret not doing? (completely). I constantly live with guilt over things I did or didn’t do for mum. We lost her 15 years ago but still there are those things that linger. I wish we had realised months earlier that she wasn’t well and forced her to a doctor. (Denial again as well as her being so protective and independent that we didn’t really know how sick she was). I wish we had bought her a decent wig when she lost her hair. She just rented one from the Cancer Council and back then they weren’t very nice. The two or three photos we have of her wearing her wig break my heart for various reasons. It’s a stark reminder of that time in our lives and a reminder that we didn’t offer to help her get a wig that made her feel just that little bit better about herself. We didn’t really know any better and only now can I imagine how she felt having to go to work and face her new reality with a half-decent wig on her head. On this second day of treatment there was a mother sitting by her daughter’s side. I’m only guessing but the daughter looked to be about 25 years of age. No matter how tormenting this whole cancer experience is for me, Ross and the kids; no matter how much of my life it is going to drain and seemingly rob me and my family of; no matter how many tests, scans and needles I have to have – it’s me and not one of my beautiful children I have to sit and watch suffer through this. When my mum was dying all she could say to comfort my brother and I — we were aged 25 and 23 — was that she was meant to go first! She was 52. I was in awe of that mother today. 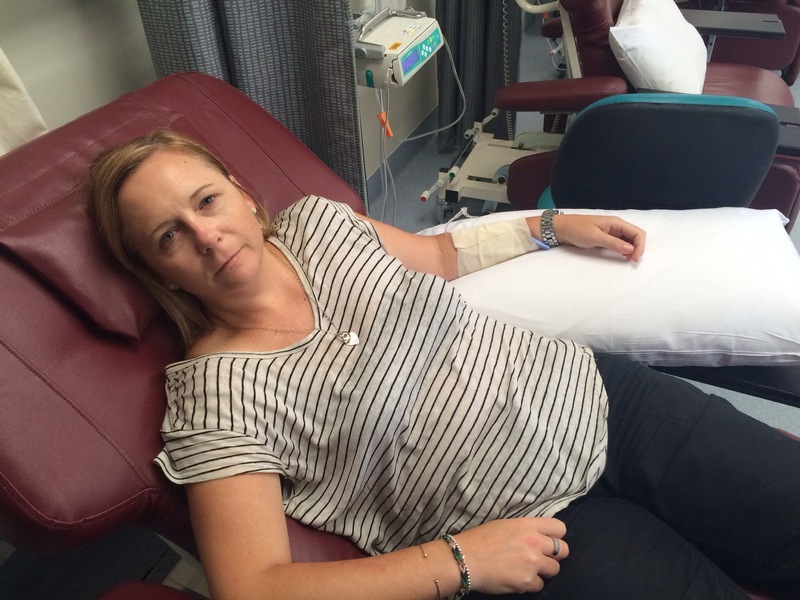 She was there for her girl, even when the nurses realised the pump hadn’t been working properly so her infusion was going to take at least an hour longer than it needed to – and she had already been there for an hour. I got to walk out after two hours. Then I get home, sleep most of the afternoon so I can go to the movies to see the Hunger Games Mockingjay Part 1 premiere with Fiona. We’ve seen the previous two together and I really wanted to see this with her. We had a great night. But I got home to find Hodgey, our not-yet-one-year-old Staffy, had chewed on of Abbey’s new Nike’s and there was a note for school about the Christmas concert. there’s rehearsals for the dance concert and the final few weeks of teeball for the year. Anyway we’ll get through this chaotic time of year – there’s so much on – between school, sport and me! The only good thing about not being able to sleep – watching taped episodes of Will & Grace and finding one of my favourite all-time episodes when Jack falls in the window while stalking Kevin Bacon. Then Will ends up dancing to Footloose with Kevin – amuses me every time.